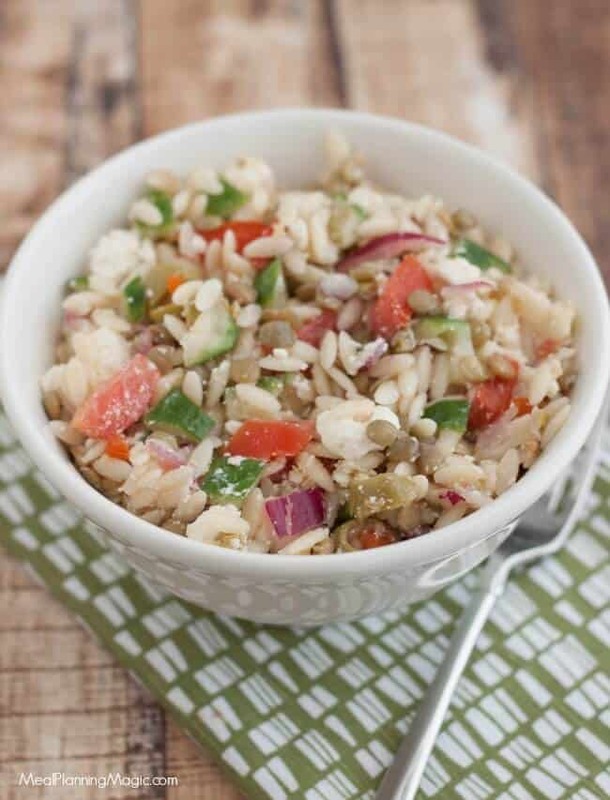 This Greek Lentil Orzo Salad a nutritious and economical way to enjoy fresh vegetables and lentils. It’s make ahead too! 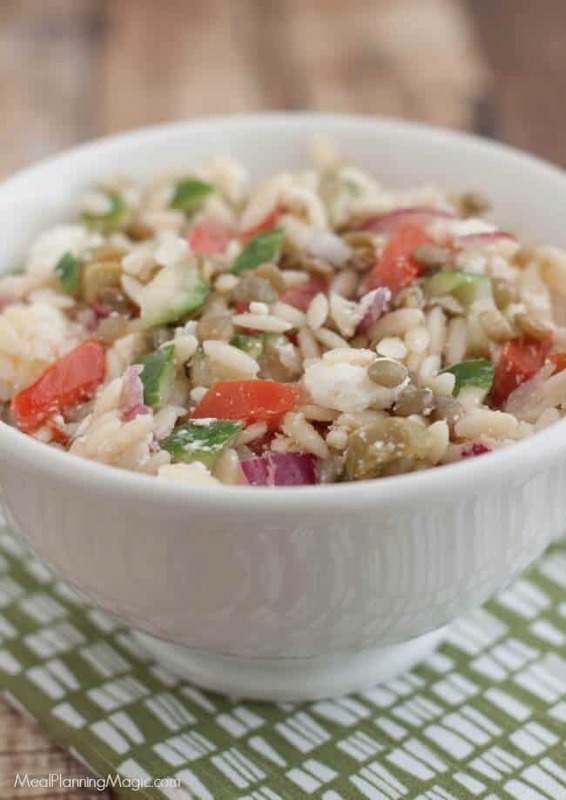 Click here to PIN this Greek Lentil and Orzo Salad recipe! 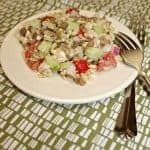 I first made this Greek Lentil and Orzo Salad almost four years ago and shared it here with you all but I’ve updated the photos and content a bit to reflect some updates. I’ll admit, until I came across this recipe, I’ll admit right up front that I had never really been a fan of lentils and have, frankly, been a little intimidated by them. But the more I read about these little powerhouses of nutrition (and economical to boot) I’ve been a bit more interested in trying to find a way to cook with them. I’ve asked my followers on my Facebook page and received many great ideas. But it was after I attended a food blogging conference those four (or so) years ago that originally piqued my interest after stopping by the Canadian Lentils booth and sampled several different recipes they were featuring there. 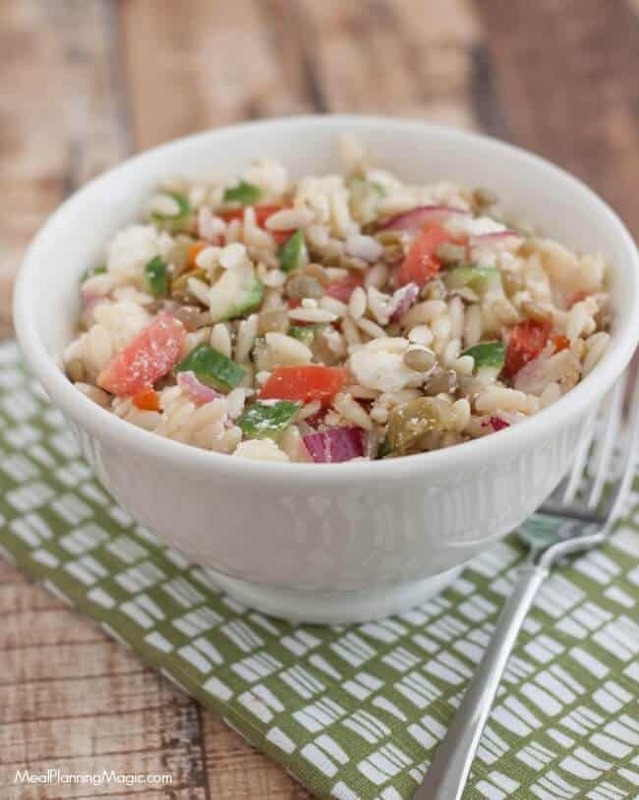 Now, I’m a bigger fan of lentils and really love this Greek Lentil and Orzo Salad! From dips to soups to even desserts (?!? ), lentils are a pretty versatile legume and I’ll admit I was much more intrigued to give them a try after attending that conference way back when. Plus, knowing that they are packed with nutrition is an extra bonus! Just 100 grams of green lentils has a whole day’s worth of fiber, more potassium than a large banana and are an excellent source of folate, iron, manganese and protein, too. I have mostly used them in savory dishes but I think trying to incorporate them in sweet dishes might be something worth trying! I will have to say I have also discovered not all lentils are equal. Prior to cooking with the green lentils used in this recipe, I had previously only had brown lentils. I’m not sure if it was how I cooked them or what, but I had mushy, kind of yucky tasting results and that kept me from trying them again. The color of the lentils makes a different and the green ones have a sort of nutty flavor. Plus I followed directions a little better this time to cook them properly! And the extra bonus? Lentils are an economical choice at about 10-15 cents per quarter cup serving each. At the conference, we got a copy of their cookbook (you can also find lots of recipes online). 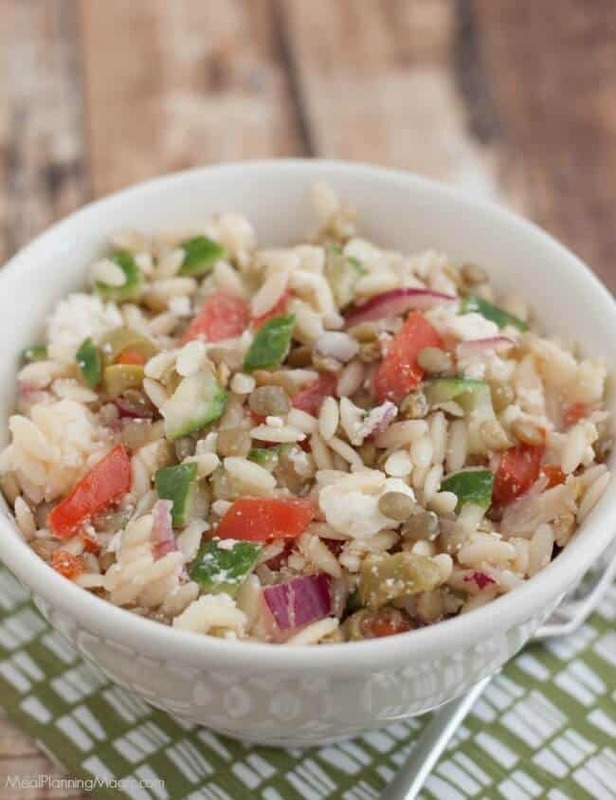 I adapted a recipe found in that cookbook to create this delicious Greek Lentil and Orzo Salad to share with you all. We love anything with Greek style flavors and this salad delivers! Packed not only with lentils but also tomatoes, cucumbers, purple onions, feta cheese and more, it comes together quickly and is easy to make ahead. I love make ahead salads like this Pepperoni Pizza Pasta Salad or Simple Ham and Broccoli Pasta Salad. We love Greek foods in our family and this dish was a winner. Greek Lentil and Orzo Salad is a satisfying and delicious vegetarian salad that is perfect as a side or light main dish that I hope you will try! 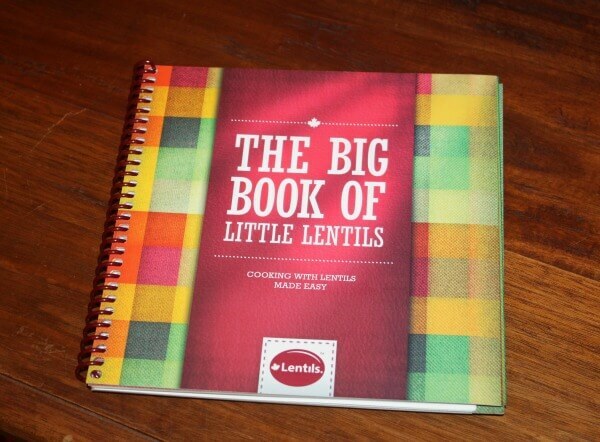 This is a copy of the book I received–all full of lentil recipes! Bring a large pot of water to boil. Add orzo pasta and cook until al dente (about 8-10 minutes). Drain. Transfer pasta to a large bowl and mix in 1 tablespoon olive oil. Cover and refrigerate until cool. Place lentils into a small saucepan. Cover with water and bring to a boil. Cover and simmer over low heat until lentils are tender, about 15-20 minutes. Drain and set aside to cool. Combine remaining olive oil, vinegar and garlic in a small bowl. 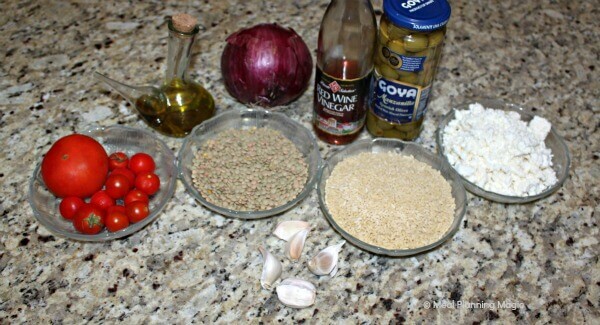 In bowl with pasta, add cooked lentils, oil mixture and remaining ingredients (olives through feta cheese). Stir until combined well. Cover and refrigerate at least two hours. This salad is also really good the next day. Simple ingredients come together for a delicious and nutritious salad. What’s your favorite way to enjoy lentils? Disclaimer: I was not compensated in any way by Canadian Lentils to include them in this post. They just helped spark my interest in developing a recipe using lentils for this month’s challenge. Brenda, that sounds really good. I have to admit I’ve never cooked with lentils before and I’m really intrigued, especially since you mentioned all of their nutritious goodness. Definitely give lentils a try! Like I mentioned, I was a bit hesitant but after trying a different variety (and having tried them at the conference) I am definitely a fan. The fact that they are economical and nutritious are an extra bonus! Yes, I am definitely going to be cooking with them more often now. So many reasons to! I made a variation of this recipe for Christmas dinner side dish (IMO, it’s a meal of its own). Instead of vinegar, I used lemon juice. I used Kalamata olives. Took out all the seeds from cucumber and tomatoes (so it’s not too watery) and add oregano and lots of parsley. It’s so yummy! I totally agree that it can be a meal of it’s own–I’ve had it for lunch many times! I like your additions/substitutions–I will have to give those a try too. Thanks for sharing!